pretty white beauties they definintely are. good to see you posting after a while. Looks great.Aloo dum is fab too,I always thought it's Kashmiri but probably every state has their own versions too. Awesome !! Dekhe jeno barir breakfaster kotha mone pore gelo. My other all time bengali breakfast favourite is "Chirer Pulao". this recipe is very delicious. have had many good bengali friends and roomies after coming to the U.S.- been to many Durga Puja feasts- simply love it. Thanks for sharing. Alur dom and luchis look great! even nicer is to see you back :). Good to see you back! And with a great post like this. Yay! You are back :). 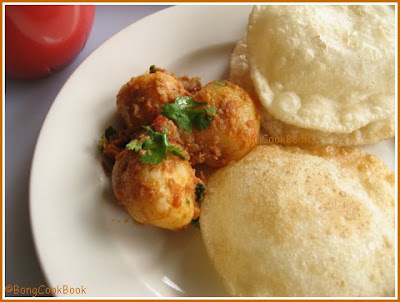 Luchi-aloor dum...oooh..my all time favorite. Even I give in to the urge of this divine call and trudge along to make my own luchi, but satisfy only with aloo-bhaja. I'm carving for phulko lauchi:D. We also make maida puri's but only during particular occasions. Yummy my mouth is watering:D.
Sandeepa, i love this. Thanks for sharing a detailed recipe so I can give it a try sometimes! whoa lady...that's breakfast?? Man...I need to ditch my Gujju theplas and get this one going! Wow, your mom's pretty industrious, eh? That is some choice, better than my WFFs! Can our generation ever measure up?? :) Missed reading your posts! Hope your break was relaxing! Sandeepa, the puffed up Luchi with the aloo looks wonderful. Thanks for explaining the Bengali breakfast and nice to see back after your self imposed break. Sandeepa, your posts are always a delight..Your Luchis are white beauties indeed...Lovely photo! wow ... the luchis look awesome ! i am visiting u r blog for the first time .. but i knw i will be coming back for more ! I am bengali myself , and the luchis have triggred a huge wave of nostalgia !!! miss bengali food soooo much ! Yes, you must let the little one enjoy as much luchi as possible, before oils, and fats, and waist sizes and figures become part of her vocabulary. I can still put away plenty of luchis in one sitting, but with a slight sense of guilt!!! I can really identify with all that you've mentioned about aloor dom and loosi(that's what we call those 'white beauties' in Assamese)...and also all the other accompaniments that go with it...In felt I was home:)...do you have luchi ar ghugni as well...its one of my favourites. Mouthwatering pooris. I think In south, restaurants use maida to make pooris. I see dum aloo becomes aloo dom in Bengal. In a way, we all eat same foods with different names. Don't you think so? A sigh of relief , for seeing you posting again and also for realizing that I have made a bengali dish without even realising that :) CJJ had a colleague from calcutta, but not a bengali as such, and she taught me to make poori with maida...i did not know that it's luchi :)and the pic of your breakfast is seriously giving me some cravings..they re real white beauties!! Hi...I am a Bengali and doing my MA in Toronto, Canada. I came across your blog and needless to say, I am fascinated. I have even saved your blog in My Favourites. I love your recipes as they are so easy to make. I was thinking of making Alu Dum for a potluck today and lo and behold, your blog features alu dum! Thank you and keep up the GREAT work!! the Pics rock Sandu! I loved the look of Luchi. so well presented. Good to see ur post after long time dear. Very busy kya these days?? these look really good. I need to get my husband's family to make these for me. He is Bengali! Oh yes, and luchi with chholar dal too! Yummm Sandeepa. I am getting back into the groove myself and what do I see? Luchi! In Calcutta our landlord taught my mom this variation. She used to add the sweet syrup from rasgullas to luchi dough. They were great too. Luchis and aloor dom are a feast for the eyes sandeepa. 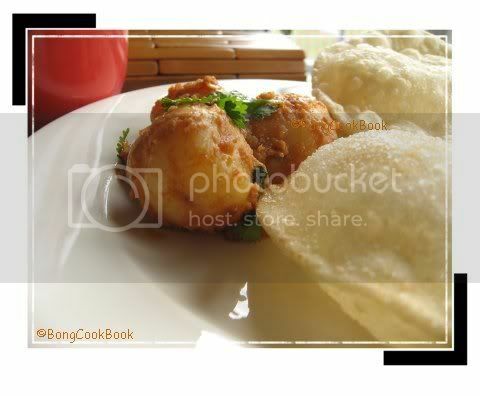 puffed up white luchis/pooris look great with the aloor dom.. Everybody loves pooris very much in my house. Aloor dom has a lovely colour. Dear Sandeepa, We all love luchi alur dom. seshpatey ektu jhola gur holey mondo hoyna. I also love to have it with a little bit of kasundi. Your mom seems to be a good cook. Does she know how to make kasundi? You and flour are not the best of friends, Sandeepa? Do you mean that you don't like to make breads and cakes, or you don't think you have the "knack" for it? Based on this tasty post, you and luchi should be bonded for life. Good luck with your next cilantro plants! Nothing like luchi for breakfast. And with mangso tarkari :) Love it! I am an Oriya and Luchi - Aloo Dum also used to be regular breakfast item at our place. The days of luxury! Nice blog. I always wondered about the difference between luchis and puris, now I know! Simply Awesome! It reminds me another delicious oil soaked item - Radhaballavi ( puri filled with daal)...remember anyone? hi Sandu, seems you are real busy. dont blog these days. hope all is fun and fine at your end. 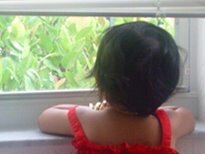 ur last line on ur 3 yr old reminded me of dhaara's ad in india.."alumutter aur garam garam puriyan"..
we never make puris with maida but will definitely try ur aloor dom. Sandeepa, I loved this post. It brought back sooooo many memories. Luchi is one of the things I crave the most and eat as soon as I get off the flight in Kolkata. Your other Bengali breakfsts were like a roll call of the stuff I used to eat. Another popular Bengali breakfast was the dimer amlette. With toast. And luchi aloo chechki. Yum! this is like puri in our side.the curry looks fantastic. Wow! 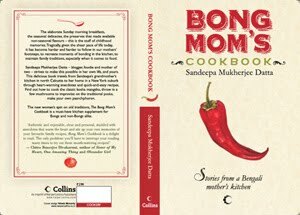 It was fun to read about Bengali food. :) Thanks for sharing it with us, Sandeepa. I'm not a fan of fried food..... usually! But I can surely make an exception to those luchis! beautiful. 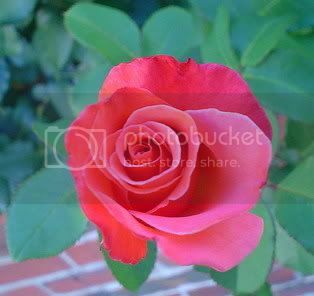 This is my first trip to your blog and am enjoying every bit of it. I recently discovered your blog from Sra's and then rediscovered it through your Dum Aloo. Purrrrrrrrrfect recipe! Just what I wanted. Family loved it!!! Can't thank you enough. Just wanted to let you know that put your link in the "Further Reading" column of my new post for dum alu. You are such a savior... i've tried a couple of your recipes and 'belisimo'! How is the name radha vallabhi or radha ballavi or radha bollobhi evolved? could anyone email me at bharat_gm@yahoo.com about this? 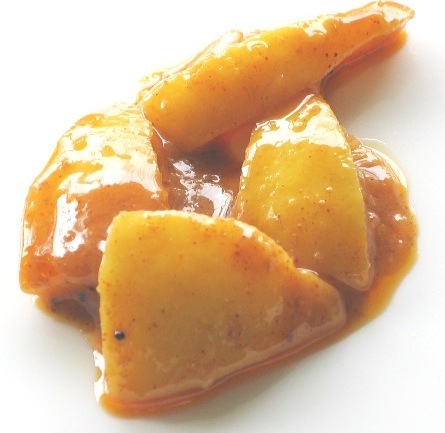 My husband has been asking about the aloo dum that is available at the puchka stand and made with tamrind. Can you share that recipe? umm typical bengali breakfast I always thought was kola, and mura-mura. Hi...Tried making luchi& aloo dum yest'day.While AD came out well,the luchis refused to swell until I rolled them out really thin..like small roomali rotis and became almost like shortcrust pastry when it got cold..not soft but stiff & crumbly..I used dough to roll out the luchis coz I cud not bear to add oil & then deep fry too..Cud that be the reason? ?Cuz I make good pooris & phulkas..Help pls..Tnx.. If you make pooris, luchi should have come out well. 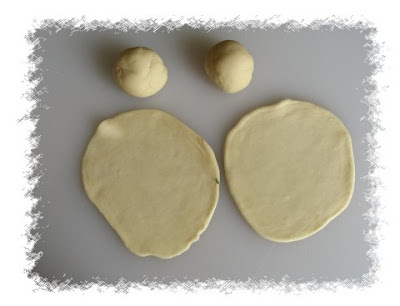 There is not much diff between two except that luchi is made of only maida/ap flour. 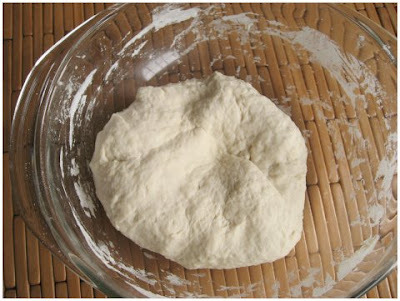 Excellent recipe and the tip about how to make the luchis gole gole as well as about the temperature of the oil. I am cooking myself for some time and find your recipe of luchi the best. They should indeed be white, not 'golden brown' as I saw elsewhere. Thanks! Btw, I love the way you write.. really delightful! This is a fantastic recipe. One of my fav!Yummy! This is a block-buster his at my home! I made it second time today for Sunday lunch and my hubby, who is not a potato-lover at all, just freaked out at it! I could never make alur-dom properly before I got hold of this recipe. Thanks Sandeepa for sharing your expertise! you have not added turmeric powder in this dish.Isn't it necessary for a bengali dish?and that too in a niramish aloor dum? 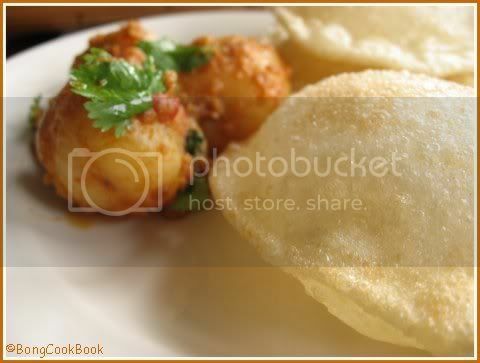 Having stayed in Mumbai for so long and the Vada Paw's we kind of miss the Aloo Dum Luchi or the Loochi Ghughni treat. This food also keeps us connected to our Heartland West Bengal. Miss you Janni and your ranna. Happy Pujas to All.. I love all your recipes but this one is very special...Please send me the recipe for aloo dum & luchi...I tried a search but to my vain didn't retrieve the recipe...it was awesome...kindly upload the same as I cannot do without this mouth watering recipe. Thanks. My idea of Bong breakfast. Wonderful samosas and hing kachori (khasta type), Kanchengola, raskadam, malai chhop and malai roll. Puri sabji which should be lighter than Radha ballabhi unless it is a special day. By the way I am not a Bong but Rajasthani but sing and play Rabindra Sangeet on my Hawaiian Guitar!!!!!! Parota and begun bhaja. But I guess luchi aloor dam beats it all. And yours looks heavenly. 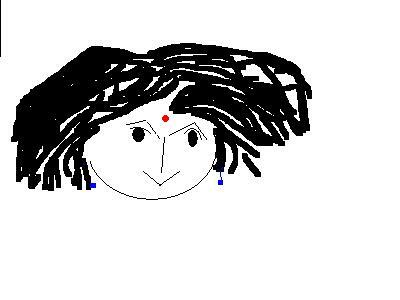 Dear Sandeepa, great Blog I must say.I want some advice on luchis. My Mom's attempts at luchis always end up in tough chewy luchis and not the soft fluffy ones.She wants to add cooking soda, which I doubt Bengalis ever add. I told her to increase the amount of oil in the dough and the luchis turned crisp. Kindly troubleshoot and explain what is going wrong.